The World Union for Progressive Judaism, with North American headquarters in New York and regional offices in California as well as Toronto, Canada, works with Reform and Re-constructionist organizations across North America. 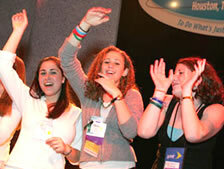 North America’s Reform congregational network, the Union for Reform Judaism (URJ), is the largest religious movement on the continent. The URJ’s national headquarters is also located in New York City; its 14 regions extend across Canada and the United States. The World Union in North America works primarily to raise funds that support the development of Progressive Jewish congregations and programs in Israel and throughout the world. In addition to the URJ congregational structure, North American Reform Jewry includes major institutions such as: Hebrew Union College-Jewish Institute of Religion (HUC-JIR), the seminary responsible for training rabbis, cantors, educators and communal workers; the Central Conference of American Rabbis (CCAR); National Association of Temple Administrators (NATA); Women of Reform Judaism (WRJ); North American Federation of Temple Brotherhoods (NFTB); the Religious Action Center (RAC), which is based in Washington D.C., and ARZA, the Zionist arm of the Reform movement. The Jewish Reconstructionist Federation (JRF), with more than 100 congregations and havurot, is also affiliated with the World Union for Progressive Judaism. Please fill out this form to share "North America" via e-mail.